Women are still awed by Audrey Hepburn’s impeccable style and glamour 55 years later. Her iconic style, along with Breakfast at Tiffany’s, one of the top fashionable films of all time has changed the way women look at fashion, accessories, jewelry, and beauty. From the adaptation of classic Hollywood glamour on the red carpet or re-enacted in photo shoots, there is a bit of Audrey in every woman. OPI Holiday 2016 Breakfast at Tiffany’s themed collection will consist of 12 new classic OPI nail polishes and a bunch in the Infinite Shine line and sets. OPI Breakfast at Tiffany’s Holiday 2016 Collection создана под вдохновением от одноименного фильма и включает помимо классических и гель-лаков большое количество подарочных наборов, так что нам будет из чего выбрать подарки себе и друзьям. 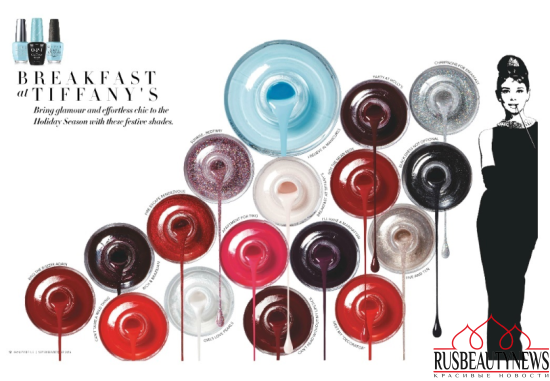 нюд Breakfast At Tiffany’s Mini Nail Lacquer 3.75ml. темно-красный Madam President Mini Nail Lacquer 3.75ml. черно-синий Lincoln Park After Dark Mini Nail Lacquer 3.75ml. красный Got The Mean Reds Mini Nail Lacquer 3.75ml. коралловый The Thrill Of Brazil Mini Nail Lacquer 3.75ml. топ Infinite Shine Gloss 15ml. 3 x Wipe Off Acetone-free Lacquer Remover Wipes. — крем для рук Avojuice Limited Edition Holly Red 250мл. вот это выбор! чувствую, скуплю все наборы для новогодних подарков! Ох, как хочется 10 минек и мини уходовый))) но привезли только 4 миньки с голубым.